Briefings are one of the primary ways to conduct effectiveness of the group member relationships. The main objective of a briefing is to keep all team members informed about problems, decisions and statuses. Remote Presentation for Skype solution is a powerful tool for brief mention should be made of all the problems. Remote Presentation for Skype solution and ConceptDraw MINDMAP helps to hear the thoughts and insights of the individual members of the briefing. Marketing research project mind map sample is created using ConceptDraw MINDMAP mind mapping software. 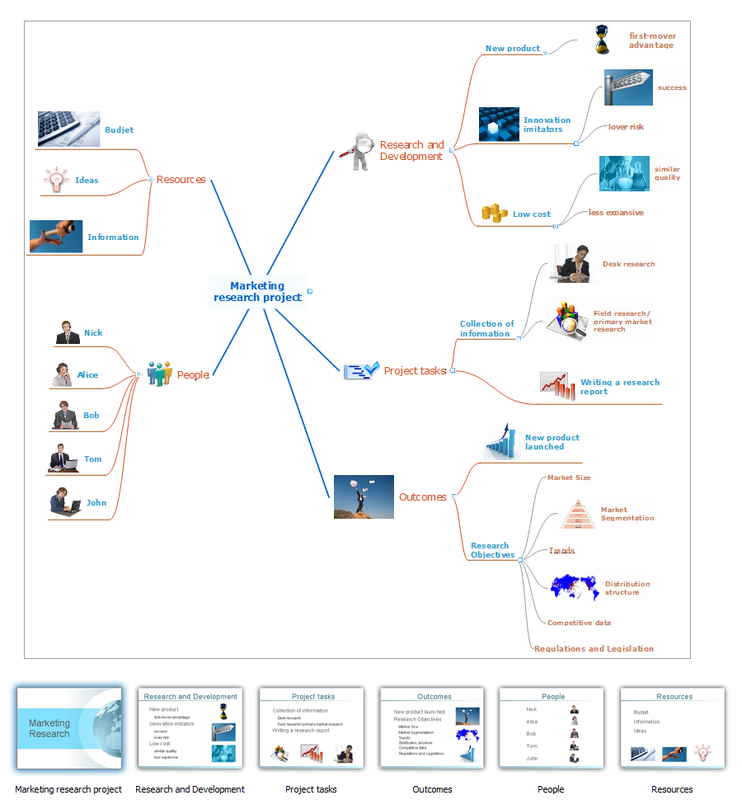 This mind map example helps to learn how to use mindmap presentation via Skype for workgroup briefings, meetings and decisions. What can you create with ConceptDraw MINDMAP v10 ? Picture: What can you create with ConceptDraw MINDMAP v10 ? Presentations are an established way of sharing ideas across a workforce, there′s no better software to create them than ConceptDraw MINDMAP v10 Using the Remote Presentation for Skype solution, you can include a workforce that is spread across the globe.